Country Reporting Stations Add Paisley's New Single Today! 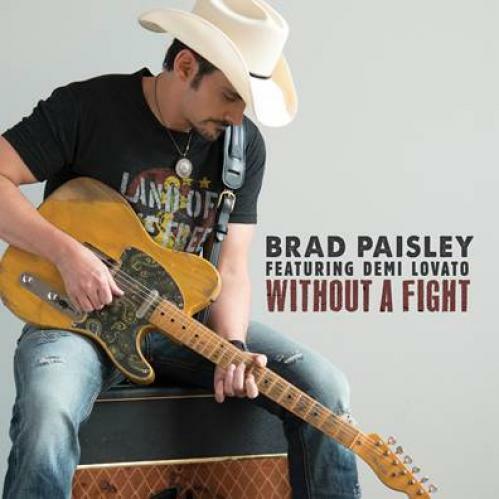 Nashville, TN - Just three days after debuting on country radio his latest single, "Without A Fight" featuring multi-platinum artist Demi Lovato, superstar Brad Paisley scores the single biggest add day of his career! Paisley's first single from his forthcoming album on Arista Nashville accumulated 120 adds today from combined Mediabase and Billboard monitored country radio stations! "Without A Fight" debuts at #27 on Billboard's country airplay chart and at #34 on the Country Aircheck/Medibase chart. Fans can download "Without A Fight" here http://smarturl.it/withoutafight and stream it here http://smarturl.it/amwithoutafight. Co-produced by Brad Paisley and Luke Wooten, the song was co-penned by Paisley, Kelley Lovelace and Lee Thomas Miller. As previously announced, the national television debut of "Without A Fight" is confirmed for Tuesday May 24th, on Jimmy Kimmel Live! on ABC 11:35pm/10:35 pm Central. Both Paisley and Lovato will perform.